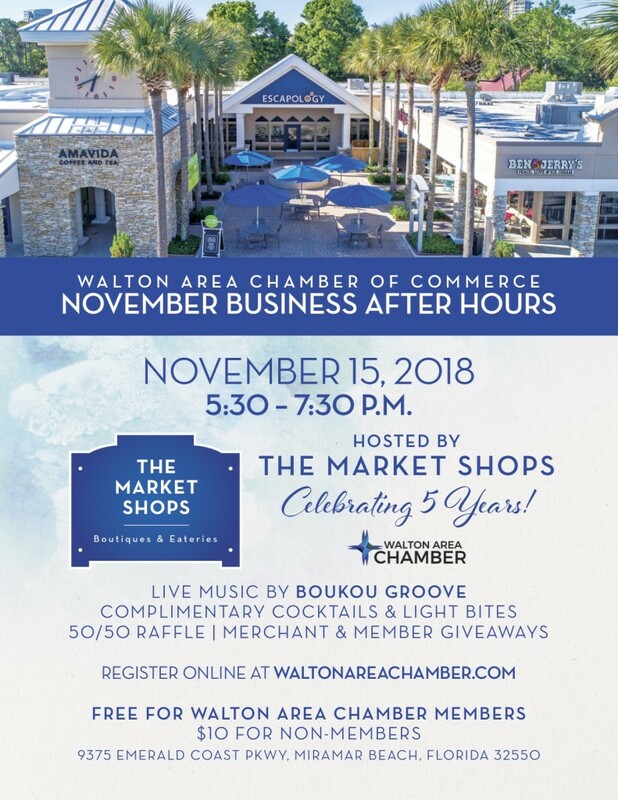 MIRAMAR BEACH, Fla.(October 29, 2018)– The Market Shops, located at the entrance to Sandestin Golf and Beach Resort, will host the Walton Area Chamber of Commerce Business After Hours on Thursday, November 15, from 5:30 to 7:30 p.m., in celebration of the five-year anniversary of the shopping center. The community is invited to explore The Market Shops while enjoying live music by Boukou Groove, as well as light bites and complimentary cocktails. Visit each Market Shops merchant for a chance to win gift cards, prizes, and more provided by The Market Shops and participating chamber members. Guests can enter to win by receiving a stamp from each merchant on their pass card, and then returning the completed card to the check-in table located in the Gazebo Courtyard by 7:15 p.m. In conjunction with the Walton Area Chamber of Commerce Business After Hours, guests are also invited to celebrate the five-year anniversary of The Market Shops. The property underwent a major renovation in 2014, which included significant exterior repair, courtyard and walkway redesign, as well as cosmetic enhancements such as landscaping. The lawn on the east side of the property has also been expanded and refreshed to host festivals, concerts and other special events, such as The Market Shops Bloody Mary Festival. The anniversary marks five years since the revamped and redesigned Market Shops opened to the public. This was the first renovation The Market Shops received since being built in 1985. Since then, the property has reestablished itself as a community location where locals and visitors alike come to shop, dine and spend time together. Since the update, The Market Shops has grown exponentially with a growing list of merchants and eateries, including the most recent opening of Amavida Coffee & Tea Café, Clean Juice, Escapology, Jon Smith Subs, Maple Street Biscuit Company, and Pizza by the Sea. By the end of 2018, The Market Shops will have 22 merchants open for business. The Walton Area Chamber of Commerce Business After Hours at The Market Shops is free for Chamber members and is $10 for non-members. For more information and to register for the event online, please visit the Chamber’s website at http://www.waltonareachamber.com.